Click here to view a video of Star taking her medicine. Your mouse is already experiencing health difficulties (often breathing), so you must take care to stress the mouse as little as possible. Do not pull the mouse's skin tight around its neck. Make certain you aren't cutting off its breathing. 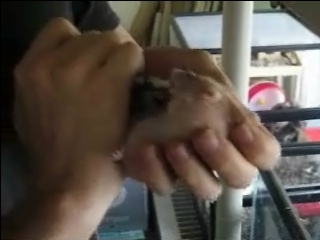 Letting the mouse's hind feet rest on something (one of your hands or a solid surface) is a must. Do not let your mouse's entire weight hang by the skin-- that will constrict the throat. If your mouse is gasping for breath, consider doing this another way (like put the meds on the end of a very small plastic toothpick and dab it ever so gently onto the mouse's lips a bit at a time, or getting an injection under the skin from an experienced vet). Be patient and kind, and very gentle. Mice scare easily, and chances are they won't like this. Don't ever force anything into a mouse's mouth, or for that matter, force anything, period. You might break your little friend. If you do this right, the mouse cannot bite you, but if it does, you MUST NOT DROP THEM! Dropping a creature as fragile as a mouse can cause injury or death. If you're worried about it, do it a foot over a bundled up blanket or towel. Avoid the nose-- the mouse breathes with it. Always feed in the side of the mouth and do not squirt meds in the mouth quickly or the mouse can aspirate or choke. Do it slowly and be patient. Get the mouse in the palm of one hand, the same hand as the syringe. I have found that when giving oral medication by syringe, the best size to use is a tuberculin syringe without the needle. With the other hand, grab the skin behind the mouse's ears and hold firmly but do not pinch, and do not tighten the throat. Lift the mouse up and back while leaving its hind legs on the first hand (the one with the syringe). Using your thumb on the plunger end of the syringe, put the syringe tip to the mouse's mouth. Sometimes the mouse will take it and lick it, or bite it... either way, you're set. Gently push the meds in. If the mouse tries to avoid it, continue to put it on the sides of the mouth, avoid the eyes, and dab a tiny amount of the meds onto the lips. Avoid the nose. Most mice aren't going to sit still for this, so be patient. The mouse must eat ALL of it. Mice need their full dose of meds on time every day. If there are other mice in the cage, they're gonna want some. You must make sure each mouse gets its OWN FULL DOSE of the medicine. This usually means supervising treat/med time. This is an exact science. No guessing allowed. You must make certain there is nothing in the treat that interferes with antibiotics (like probiotics, milk, yogurt, calcium, and a number of other things). Sugar, salt, fat are all fine, as are most bread things and such, but make sure you do not give your mice pure sugar or salt - that's VERY bad. Note: Once you start using antibiotics, you MUST continue for the entire duration, which is often at least 14 days.